This is the first in a series I would like to call "What is Scott Doing Now"? It seems that I have "gone missing", people ask me where have I been, what am I doing? Well, I have been busy and have not had the time required to keep this and many of my other blogs current. I love my Trading Assistant Journal readers just as much as I hope they appreciate me, and in fact I want to thank the readers who have sent me notes of concern, wishing me well, and asking me to come back. I am still here, I just have been so busy working for clients and on my own projects, that I have not had time to keep up with a lot of the stuff I used to comment on here in the Journal. So without further adieu, Part 1 - "What is Scott Doing Now"? In our vast eCommerce world Bonanzle.com has been one of the hottest topics of discussion for over a year now . As a venue Bonanzle has many advantages for sellers. Simplicity, Social interaction, seller camaraderie, ease of use, customer service from the founder himself... Bonanzle has a lot to like. When a new merchant comes to Bonanzle from eBay or elsewhere, they are usually struck with the speed and ease of use of this well laid out platform. From the very first day of operations, this site has been clean and quick both on the front end and on the back end where merchants spend most of their time. 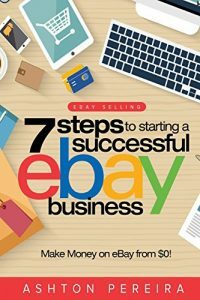 The speed of listing product, either one at a time, or through a bulk upload and then a bulk editor (both included) is a major factor attracting merchants familiar with the multiple page listing processes of eBay. This simplicity and speed are major factors that can improve the bottom line of any seller. The fact that there are no listing fees and only a small final value fee - if an item is sold, is another top pick on the feature list at Bonanzle.com. Sellers are joining Bonanzle by the thousands, the growth curve of Bonanzle has been phenomenal - some say... even faster than the original eBay. Yet with all of the great features of Bonanzle, and there are many, it struck me that the one thing that was missing from the merchant experience at Bonanzle was a home base or store. 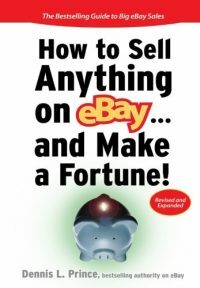 Come to think of it, at eBay the "eBayStores" product has never been a real home base or place to build a business for merchants. 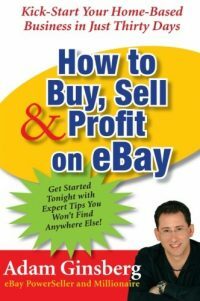 I say this, even though I was at one time an eBay stores promoter, designer and owner, because at eBay you had no way to bring your customer back to you. The entire eBay Stores strategy was sold to promote the idea that a merchant could have that "home base" but in reality the home was just a temporary shelter - with high fees. If you are starting or running an online business selling products, unless you are happy to be anonymous, it is best to build a "location" on the net. A Storefront or a business office so to speak. A Place where your customers, new and old, can find you, and find out more about you and your business. A place where, as a business owner, you can choose to educate the public (your customers) with more information than is included in a standard description of a product for sale. Now I don't want to say that at Bonanzle there is no "Store". Bonanzle's "store" is called a booth. A Bonanzle Booth is a central location grouping all of your listed products together by category. The booth is great, but since it is dedicated to the Bonanzle tenants of simplicity and clean design (something I do not disagree with), a Bonanzle Booth does not lend itself to merchant branding or education of the public or much of anything more than presenting the merchants products, with 4 images and a very clean description to the outside world. For many merchants, this may be all that they need. For others, something a little more personal may be appropriate. As a result, my company, iBusinessLogic has created a new way to optimize a Bonanzle merchants business and Internet marketing capabilities with what we call the BonanzleStore. A "BonanzleStore" (launching late summer 2009) is an outside website, separated from Bonanzle and allowing the merchant to brand themselves with a completely customized eCommerce Web 2.0 Site. This website (A BonanzleStore) will include many features never seen before in eCommerce. The main feature is a completely automated and constantly updated presentation of the merchants products for sale. One inventory, two selling locations - i.e. list an item on Bonanzle, and it will appear both on Bonanzle and on the merchants BonanzleStore site. Sell that same item, and it will be removed from both locations. No chance of over selling inventory. Combining the ease of use of Bonanzle itself, along with the automated Googlebase feed and Oodle feed, the simple checkout using PayPal, Cash, Check, Google Checkout and other options, makes this a very efficient and symbiotic relationship between a venue (Bonanzle) and a Merchant Home website - (BonanzleStore). Where the website offers a home base and more, the venue offers simplicity and ease of use. Where the venue is clean and efficient yet sparse and mostly unbrandable, the home base allows for unlimited expansion, branding and content dedicated to promoting the merchant and his or her products. The two work together as a team to bring more traffic and more sales to any merchant who uses each to its full advantage. With this unique combination of a website working with a venue, most merchants will enjoy a freedom to express themselves and promote their company like they have not experienced before. This is web 2.0 and social marketing meets eCommerce shopping cart. BonanzleStore combines many of the best of both worlds and makes it easy to manage both a website and a venue with ease. 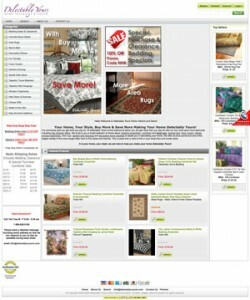 To see a working example of Alpha2 (Soon to be Beta) of our Bonanzlestore please go to one of my sites: http://allbusinessauctions.com/blog/bonanzlestore-demo/ here you will see the products of the Delectably Yours Decor (Bonanzle Booth DelectablyYours) presented on a completely off topic website/blog. These products have been parsed by category automatically by our software and are automatically presented on pages on the site with pagination which can be adjusted according to the users preferences. The most interesting result of this BonanzleStore system is found when one selects any of the titles or any of the description content and then pastes that title or description content into Google search. Remember, these products, presented in the demo on All Business Auctions, are showing the same exact titles and descriptions as they do on DelectablyYours Bonanzle Booth, her own website www.delectably-yours.com, on eBay and on Ooodle. Some of these products have been indexed on her own website for months. 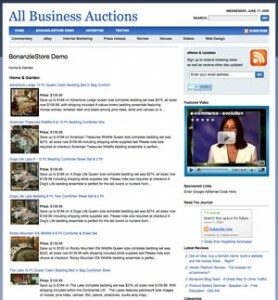 In most cases, when using the title of a product displayed on the demo, the search results will include the allbusinessauctions.com/blog/bonanzlestore-demo as the number one, two or three result in Google. These products are sold by other sites and other merchants, Delectably Yours Decor has worked hard to optimize their own website for search and her titles usually are ranked on the first page either from her store, from Oodle or from Bonanzle or eBay, yet our simple demo pages on ABA/blog a site with completely unrelated content (I don’t write about interior decor on that site) is ranking extremely highly in Google (usually outranking either Bonanzle or eBay and sometimes ranked #1) and has done so since the first day we installed the Bonanzlestore alpha test. I think our BonanzleStore may very well become a eBay store killer, but more than that, what we are building here is a entirely new way to market products sold via a venue like Bonanzle. Kind of a have your cake and eat it too approach. With the unlimited linking between Bonanzle and a merchants BonanzleStore website, the ranking in search will only increase, the longer the two locations work together. Combine this with the fact that all of our BonanzleStores will be tied together by the same category and tagging system, and what we will create is a SEO optimised powerhouse of merchant websites which are all easy to use and yet individually unique with their own URL and branding. So, you have already uploaded your products into Bonanzle.com, you are familiar with the process, like the speed, appreciate the checkout options the bulk editor and all the other easy to use features of Bonanzle! Right? With Bonanzlestore – NONE of that changes, you only have to do that process once, just as you are now. No extra work for you as the merchant for displaying products. What do we add with BonanzleStore? As you said: an outside presence on the net, your own destination a place to build a business and to create repeat customer traffic. Any effort you make as a merchant to offer the public information in your own words is rewarded with… Traffic. Traffic includes buyers, new customers, people who would have never found you in any other way. Of course it does not hurt that your products will be listed very highly in search and indexed almost immediately because you are using a Bonanzlestore. Bonanzle is unique in that they allow linking – so you could link from each of your Bonanzle listings to your Bonanzlestore, or to an article on your Bonanzlestore, and all of those links, coming from a very well regarded and ranked internet site like Bonanzle will only increase your websites standing and ranking in search. This is a system that builds upon itself, and it will also be linked to all of the other Bonanzlestores who join our program. All tied together through a huge database of tags and category listings to form a massive web of similar sites all becoming one huge target for search engine spiders. I know all of that may be stuff most of you have not considered, but a single website – standing alone, can never compete in search like a group of sites on the same system can. This is the reason why as Bonanzle grows, it becomes a perpetual thing, as each member ads content in the form of listings, the search engines must return to feed on that content, more listings, more visits by search bots = higher ranking. nothing can stop the growth of Bonanzle now and it will be a huge site for a long long time. By working with Bonanzle, within a system of sites like I propose, with each being unique but still tied in together to form a matrix of information (through the tagging and category systems – no one will see your private information) we will create the best performing, most unique ecommerce system of socially connected, and information rich sites in the world. You will have more than your moneys worth, and you will get more traffic than you expect. But only if you join in and learn how to use the system to your advantage. This is not set an forget Internet marketing, this is for people who are passionate about their business and the products they sell, just as I am sure that Tackmakr is about the Saddle and Tack business. No ecommerce store or shopping cart allows the flexibility to do all that I have described (and more). No open source shopping cart is indexed like this, and no other system is setup to take advantage of all the things you love about Bonanzle, while supporting Bonanzle in the process. "For us terribly tech challenged peeps that are trying to understand. A Bonanzlestore is your own website but hooked up to our Bonanzle booth? Now if I can have my listings here show on page 1 of google whats the point of a Bonanzlestore? Speak simplistically please LOL"
The products you currently list on Bonanzle may certainly appear ranked on the 1st Page of Google – usually found if someone is searching for that exact product title or description… This is one of the great advantages of Bonanzle! Yet, with the “Simplicity” of standard Bonanzle listings you are relying on the internet shopper to find your product by typing in the exact same title and or a portion of your published description in their search box to find your product and then you. With a Bonanzlestore your products are still listed on Bonanzle and still found in search on Bonanzle, plus they will be found in search on your Bonanzlestore website. Sometimes above the Bonanzle listing, sometimes below, but both instances will be indexed. So, why have a Bonanzlestore website? This really depends on your passion for your business. Because if you are just depending upon buyers find your products one by one, if they happen to search for the words you selected exactly as the title or description of that product and you are happy with that, you will be happy without a Bonanzlestore. With a Bonanzlestore website however, you will have an opportunity to build a destination on the web, where the internet surfer becomes your customer. A destination which provides more than basic information, one where its about more than simple descriptions or products for sale. With a Bonanzlestore website, any Bonanzle merchant can create a destination website which will bring in new free traffic by utilizing more than the titles and descriptions of products. With a BonanzleStore site the options for bringing in targeted interested eager traffic, expand exponentially simply through the publishing of unique content related to the product categories and niches sold by the merchant. With a BonanzleStore merchants have the opportunity to engage with buyers in a way not found on any ecommerce shopping cart. Every page and every article provides the merchant with incremental traffic all building up over time to become a hub of niche related activity. Your involvement is required however. No one is pitching a get rich quick scheme here. Each merchant will need to have a passion for the business they run and use the site we provide to its ultimate potential. But we will be here with you all along the way providing help and instruction. you. Cliff provides information to an ever growing audience with an amazing wealth of information related to his niche that no other site in the world provides. He gains a new audience with each movie star, each magazine or sports legend he profiles on the meld, all while passively offering the products related to those profiles of movie stars and sports legends for sale on the site. 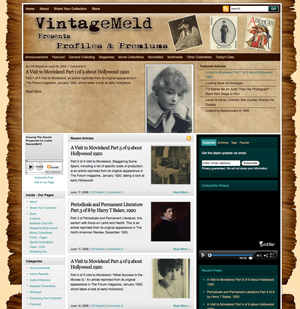 Vintage Meld is an amazing website that did not exist before we worked with Cliff to produce it. That work and his understanding of the concepts I was teaching him during its creation, is the basis for what the system I now call Bonanzlestore. I am proud of the work we did for Cliff and I will be even more proud to help each and every Bonanzle merchant to duplicate that success in their own niche. Buyers from around the world find Vintage Meld through search. Yet they find it through more search terms than are related to the actual products Cliff lists on Bonanzle or eBay (and then published on the Meld). They find that site because of the incredible wealth of information Cliff has built over time, which makes the meld a “destination” website in his world of collectibles. Other sites link to that site, even competitors – sending Cliff new buyers 24 hours a day. Have a Great Day! And Thanks for reading the TAJ! Scott you have an absolutely wonderful e-commerce tool in your BonanzleStore platform for sellers to cross promote their items in a format that will allow them to add more valuable content than is customary in an item’s description. It is true, valuable information buried in a description often is never seen or picked up during a search. Identical information included in a blog format or article will be picked up, indexed in the search engines much quicker. I have personally completed extensive tests on this and there is no denying it is a valuable resource e-commerce store owners of any type will not ignore if they are dedicated to their businesses success. As a BonanzleStore owner adding valuable content to your site you become an author, a respected authority. Successful sales of any type and more importantly in e-commerce where your clients can’t touch, feel and pick up the items you are offering you must be viewed as having knowledge about your product(s). You must sell yourself before you can sell any other type of product. Sell yourself, know your product = end result; a buyer clicking the buy now button not only once but coming back in the future and spreading the word to their family and friends. Thanks for an awesome tool Scott!